Refined knitwear and hidden circular forms, modern punky layers and hand painted text; mineral stones on silk, floating gothic ruffle, sequined evening gowns to embroidery, hand stitching and playful bursts of irreverence all featured in the array of collections at the iD International Emerging Designer Awards held over two nights at the Dunedin Town Hall during iD Fashion Week. Collection by Artur Stec, Poland. Photo credit: New Kid. The selection of 43 designers hailed from as far afield as Dominican Republic, Japan, Poland, Hong Kong, Croatia, United Kingdom and the U.S with designers closer to home also selected as finalists. In previous years, iD Fashion Week has included not only the Emerging Designer Awards but also featured a night of collections from local designers at the Dunedin Railway Station. But this year the focus has shifted solely to the emerging designer collections. DJ Sug set the scene as audience goers took their seats in the auditorium and as the lights dimmed, Auckland-based musician Anthonie Tonnon took his place on the stage with a perfect mix of kitsch electronic drum beats, velvety vocals and swerving guitar riffs sending vibrations through the floorboards throughout the evening. This year, menswear featured strongly in the range of collections. Artur Stec took out the Rodd and Gunn scholarship for his cohesive dystopian collection (above) which included multi-functional garments. Many of the menswear finalists addressed a societal shift towards ‘inclusion’ and the pulling apart of gender barriers, each with a unique interpretation on the theme including U.K designer Jasper McGilvray's tongue-in-cheek collection with its pub culture motifs juxtaposed with overtly girly embellishment to Otago Polytechnic graduate Dylan McCutcheon-Peat's immaculately conceived suiting re-imagined with a view on subverting the male gaze and questioning mainstream views on masculinity. Presented on a multi-level stage, vertical panels provided a multimedia backdrop with images and a live video feed projected on to them as the models made their way down the runway. In-keeping with the intimate viewing experience previously provided at the Dunedin railway station, the same level of intimacy was not lost in the Dunedin Town Hall. Models were sent from the runway weaving in and around the auditorium, making their way up to the dress circle. But while the space was utilised to its maximum potential it also proved distracting for viewers. Once the models hit the auditorium floor the audience’s focus was pulled from the following collection as it arrived on the main stage. A sense of drama was also lost in the process as the main auditorium lights were turned to full. With so many components a big show like this is very difficult to pull off. But at the heart of the event is the celebration of the talented designers who have been selected from top fashion schools around the world. This year the calibre was particularly high and the awards section of the evening on Friday night was a nail biting experience for that very reason. Each designer deserved their place on stage, but only one could take out the main prize and this year designer Damir Begović, a graduate of the University of Zagreb was awarded the H&J Smith First Place Prize. Speaking clearly of the designer’s connection to his cultural roots the collection made a lasting impression as soon as it arrived at the top of the runway. Evoking a feeling of beautiful fragility, three of his five looks were fully masked creating a strong sense of story and character with the masked models assisted onto the runway. But whether in motion, or in stillness the collection had a theatrical and moving presence. Begovic's collection 'Ex-vonia' explored the migration of Slavonian natives and the loss of identity and heritage. In constructing his garments he also applied unique techniques from Croatia to bring his pieces to life. "My collection is about the sadness of leaving home and migration," Damir Bregovic told New Kid. Damir Begovic collection on stage at the 2018 iD International Designer Awards. Photo: NEW KID. Bregovic was surprised to have taken out the top prize at the awards night. “I can’t believe I won the award [and] I’m very flattered [because] it means that my work is good on [a] global level,” said the designer. 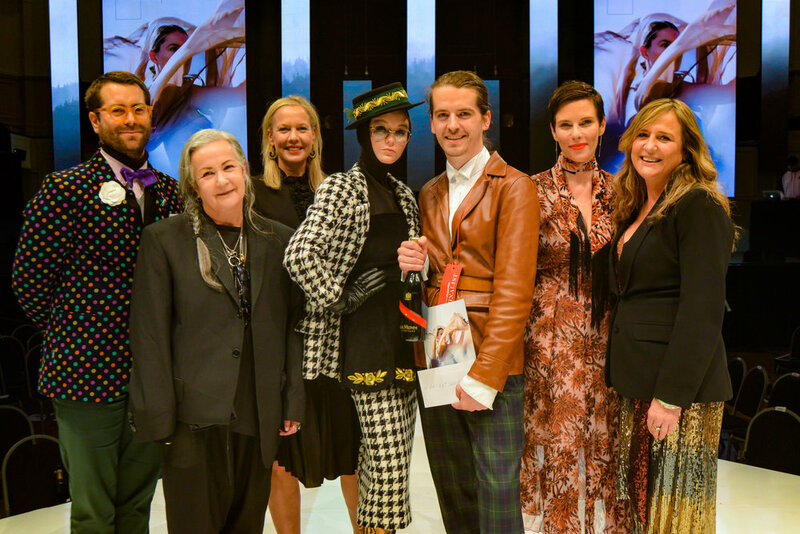 The judging panel consisted of Head Judge Tanya Carlson and long-term judge Margarita Robertson (of NOM*d), alongside guest judges Karen Walker, Maggie Hewitt (of Maggie Marilyn), Benny Castles (of WORLD) and Amanda Linnell editor of Viva magazine. Designer Karen Walker said Bregovic's collection stood out because of it's clarity of conception and although he presented five very different looks each had its own merit while ultimately tying back to a strong theme. While long standing judge of iD, Margarita Robertson said the Croatian designer took huge risks which paid off. “[He had] a mixture of referencing his culture but also recognising the couture world using traditional fabrications like the hounds tooth [which] is actually quite brave,” Robertson said. NEW K!D congratulates all of the designers from the Designer Directory who made the list of finalists including; Madeleine Jost, Vina Lilliani, Dylan McCutcheon-Peat, Alissar Hammoud, and designer Misaki Oba from the University of Technology (Sydney), who won The Fabric Store Award For Excellence in Design.